I'm always on the lookout for practical and elegant looking ways of carrying my decks around, and with Patrick Kun's Classic Card Case, I'm happy to say that I've finally ended my quest successfully. I'm sure that other cardists who carry around decks like I do will love to hear about this great product, so I took a few photos and have done a write-up/review about it. I've tried clear plastic cases (very practical, but not elegant) and I've tried card clips (elegant, but not fully protective on all sides), but nothing was entirely satisfactory. 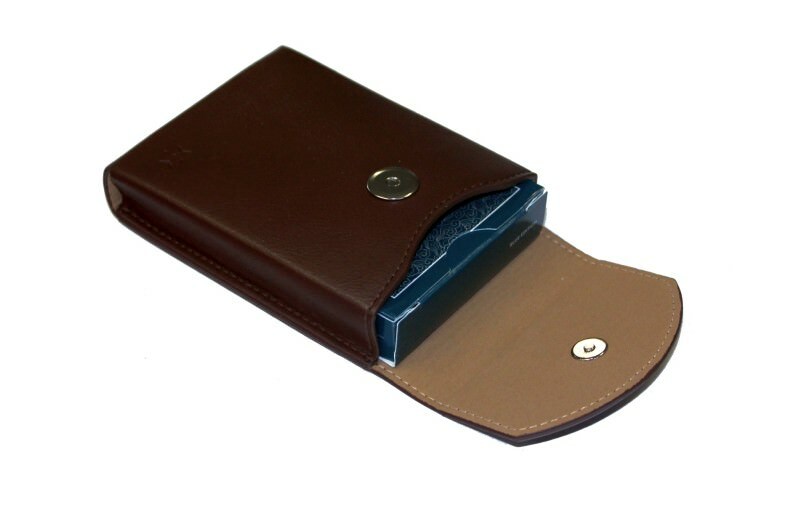 Now to the rescue comes this Classic Card Case, which is an all leather product that encloses the deck on all sides. It's a result of a colloboration Patrick did with Gentle Miracle in South Korea, and comes in either black or brown; I have the brown version. A magnetic press-stud style fastener keeps the case closed, with strong magnets ensuring that our case doesn't open at the wrong time. The inside has a tan look and stitching on the outside, which looks very classy. Putting a deck inside feels like a tight squeeze at first, but in reality it would be more accurate to just call it an "exact fit", and this ensures that our card box doesn't get damaged by moving around inside the case. One feature I really like is that you do not actually need to remove the tuck box to access the cards. If you put the deck inside the right way, you can just open the flap while leaving the box inside the case, and easily remove or return the cards. On the reverse side there's even a pocket into which you could put a credit style card if you really want, or an extra playing card or gimmick. 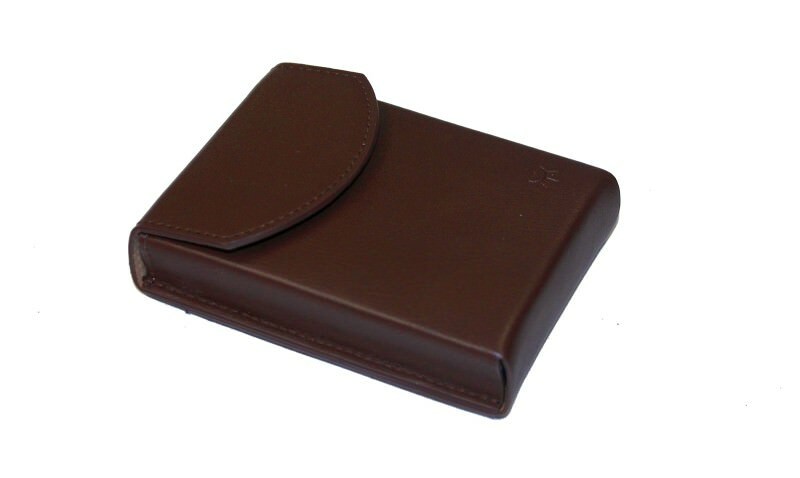 I've looked at a number of different options for card cases and clips, but right now, this is easily my favourite in terms of the kind of case that is perfect to use for taking a deck around with me when going placed during the day. A classy look that is completely functional at the same time - what more could you want? It's not cheap, at around US$40, but as anyone who has looked into a quality card clip knows, quality doesn't come cheap, and you get what you pay for. These card cases are available directly from the patrickkun.com website here. I'm very pleased with mine - for me at least, my quest for a quality case for carrying around and protecting a deck is over! Highly recommended! 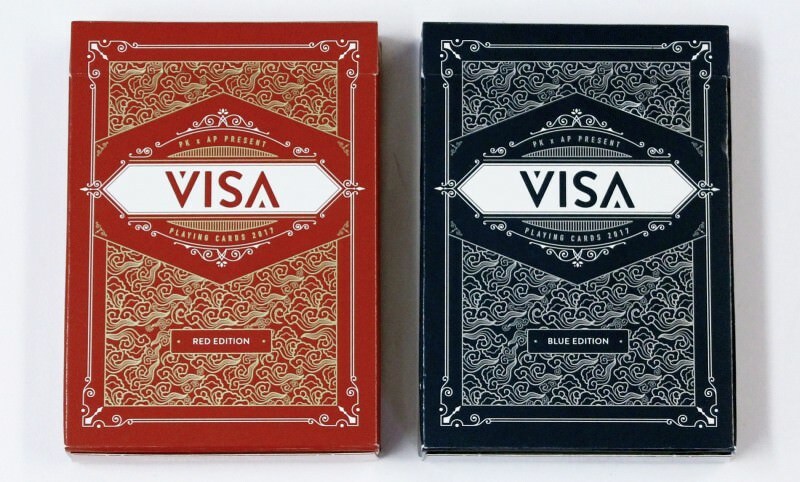 As part of another collaboration, this time with Alex Pandrea, Patrick Kun also produced the Visa Playing Cards, and I recently got a couple of these decks as well, and was super impressed. The Visa decks are about escaping, discovering, and journeying - the word "visa" naturally evoking the idea of trips to foreign places. But you can retain a luxury look even when you're on a journey, and that's what these classy tuck boxes prove, with striking colour combinations: red/gold for the Red Edition, and blue/silver for the Blue Edition. A Private Reverse Edition of the deck in white/gold was also released, in very limited numbers, with only 500 produced. For the main decks, the combination of red/gold is stunning, with intricate gold producing a pattern that brings to mind flowers, waves, or perhaps clouds. The deck title is presented in a banner, the A of VISA stylishly mirroring the letter V.
The card backs use the same pattern from the tuck box, while two circles give a focal point of interest, the words "Escape, Discover, Journey" around each. Finished off with a solid border, it makes for a very classy look. The artwork on the faces is a standard design, but intead of the garish red, yellow and blue usually seen on court cards, there's a more regal red and deeper blue, with a wealth of metallic gold. This metallic gold looks super classy, and I can't say enough about how stylish and elegant it makes the look, which fits well with the card backs. 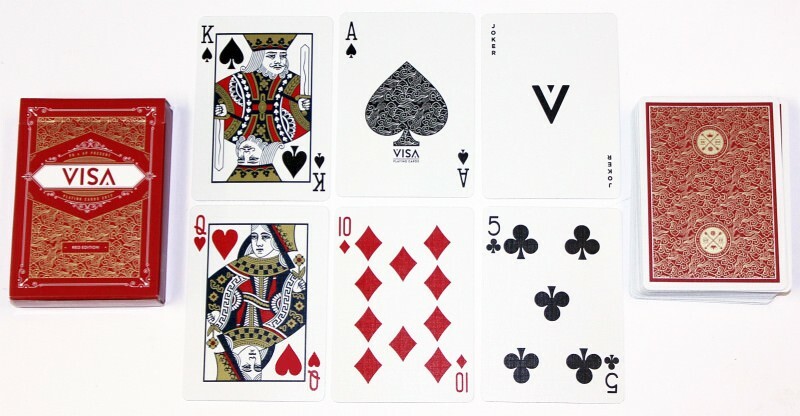 Minimalist Jokers both feature the V icon from the VISA title, and two extra cards are included for magicians. Produced by USPC, the cards also handle fantastic. 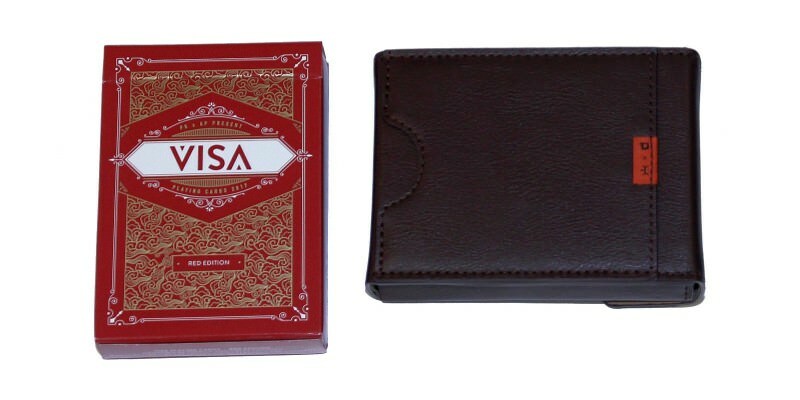 These decks are extremely practical, and are especially a great choice for magicians, given how true they stay to the traditional design, while adding a touch of class at the same time, especially with the regal look of the court cards. These are great workers for magicians or card players, looking to add a touch of real class to a standard deck. Want to learn more? 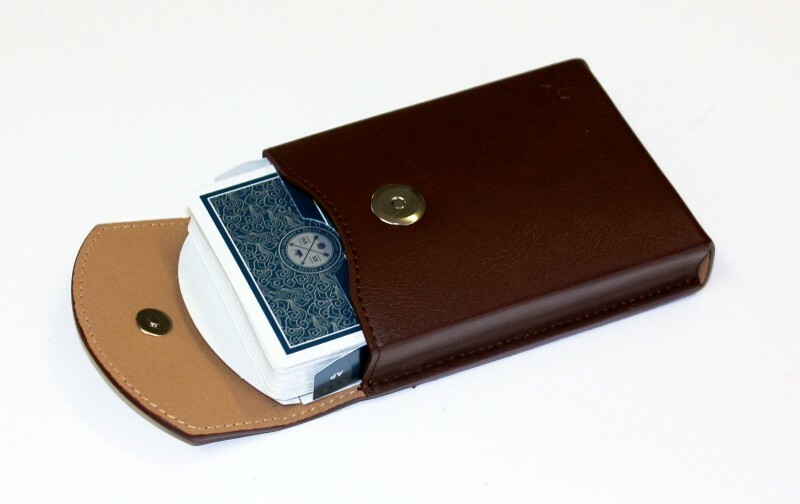 The card case and Visa decks are both available from Patrick's website patrickkun.com.